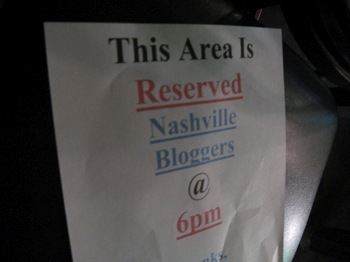 Thanks to Ginger for organizing last night's Nashville Blogger get-together at the Flying Saucer, and for the roomful of bloggers who showed up (even from out of town) to give us all a night of interesting conversation. Thanks also to Brittney Gilbert, whose work at WKRN's Nashville Is Talking turned a bunch of Nashville bloggers into a Nashville Blogger community. Thank YOU, John for coming! As always, it was a pleasure to see you! It was a pleasure meeting you. Great post. It was a fun night.